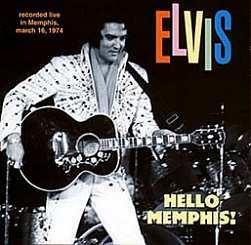 This is a great cd from Rock Legends documenting Elvis' first performance in Memphis since 1961. The cd contains the complete March 16, 1974 matinee in excellent sound quality. The mix for this particular cd seems to emphasize lead guitar, bass, and drums; while the horns & strings are lowered somewhat. It's quite evident that Elvis and the band are up for this as the show is very energetic, and the rhythm section is in very fine form. Elvis' voice is just a touch scratchy from the flu or a bad cold, but he still gives 100% as in all the shows from this tour. 'Also Sprach Zarathustra' and an energetic 'See See Rider' open the show, followed by an affectionate "Hello Memphis". Elvis then quickly moves into a very good 'I Got A Woman' followed by a warm welcome and tells the audience it's a real pleasure to be back home again. Next are strong versions of 'Love Me' and 'Trying To Get To You', and this leads into an excellent 'Steamroller Blues'. This version benefits from the above mentioned mix as it is not drowned out by the horns. Elvis follows up with a warp speed version of 'All Shook Up' and then gets caught drinking water during the opening bars of 'Teddy Bear/Don't Be Cruel' and has to hum the first words. A very rare word for word 'Love Me Tender' is next and then Elvis and James Burton light up a fantastic 'Johnny B. Goode'. 'Hound Dog' is given a better than usual kick and then Elvis delivers a good take on 'Fever' despite altering the lyrics. 'Polk Salad Annie' is excellent, in fact the best version I've heard from 1974. 'Why Me, Lord' is very soulful and gives Elvis a chance to catch his breath as he next delivers a terrific 'Suspicious Minds'. This is another tune that benefits from the mix as James Burton's guitar is well evident throughout. This is the best version of this song from 1974. The group introductions are next and then Elvis launches into a strong effort on 'Can't Stop Loving You'. Next Elvis introduces his new record 'Help Me' and this is another outstanding effort. Even better are 'An American Trilogy' and 'Let Me Be There'. Both of these songs showcase totally committed group performances. Elvis then asks for the house lights to be turned on and gets his first look at the interior of the Mid South Coliseum, and then admits he didn't know how big it was. Finally, 'Funny How Time Slips Away' and 'Can't Help Falling In Love' bring the show to a close. The show runs 56 minutes and while it might be a tad short, it is an outstanding show. Rock Legends has produced a real winner here as the March 1974 tour was probably Elvis' best from start to finish in terms of quality and commitment. Another interesting show from this tour is the March 12th show in Richmond which is rumored to include 'You've Lost That Lovin' Feelin'' and 'Mystery Train/Tiger Man'. All you VERY NICE PEOPLE who provide us with these wonderful shows might want to check that out. I along with the rest of the serious fans could use a little help with that.